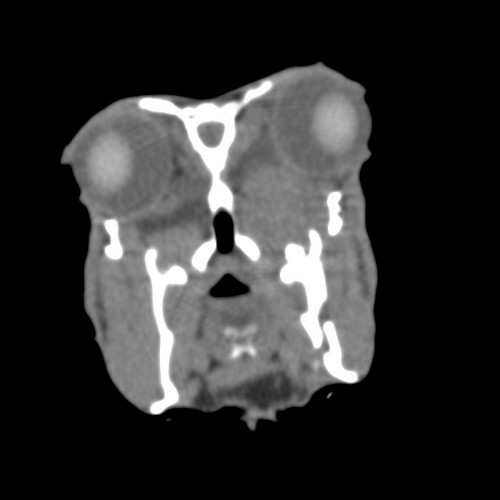 We took Rufus’s head CT scan on Monday. Dr. Keller made his diagnosis as a Retrobulbar Abscess. Following picture shows his CT scan (pre contrast). His nose is facing towards us, so that the right side of the picture corresponds his left cheek. Under his left eye-ball (on right side of the picture), there is a wide area filled with something. 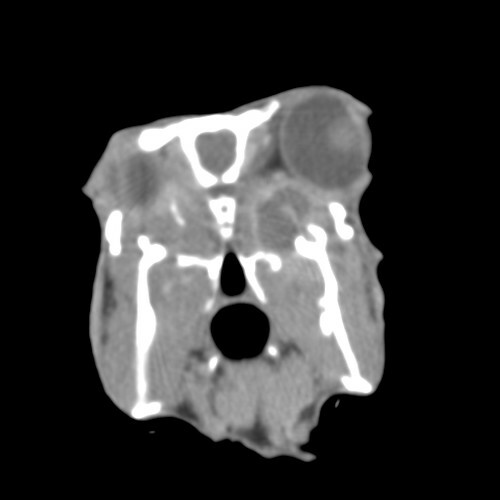 To get clear image of the area, we did contrast CT scan. I added red arrows and circle in the next picture. Inside the red circle, arrow A pointing the center of abscess. If this is not an abscess but a tumor, the color should be white, Dr. Keller said. He didn’t have any inflammation inside his mouth at two weeks ago, but this time Dr. Keller found a 1-inch circle inflammation behind Rufus’s left molars. She found pus too, seems like draining from the retrobulbar abscess through the area B (where the arrow B points). We start medication with penicillin injection. Rufus ate 2 Tbs of pellet and drunk 60ml of orange juice + royal jelly in this morning. He still keeps his appetite, but we gave meloxicum 0.3ml this morning because now he seems start to feel pain. We keep our eyes on his face and appetite.